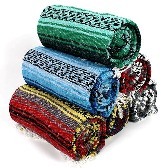 The thick to the touch & heavy Mexican blanket is extra bulky, making it one of the larger yoga blankets available. These plaid yoga blankets are made from 100% regenerated fibers. These blankets are heavy, weighing About 5 pounds each. The manufacturing process makes this blanket extremely soft and thick to the touch. These blankets can easily and safely be washed in a regular washing machine. Use this blanket for warmth, comfort, extra padding, or to lend support for yoga positions. Each blanket is 80'' long by 62'' wide. The blankets all have plaid patterns. We cannot specify colors on this product blanket, are available in assorted colors.